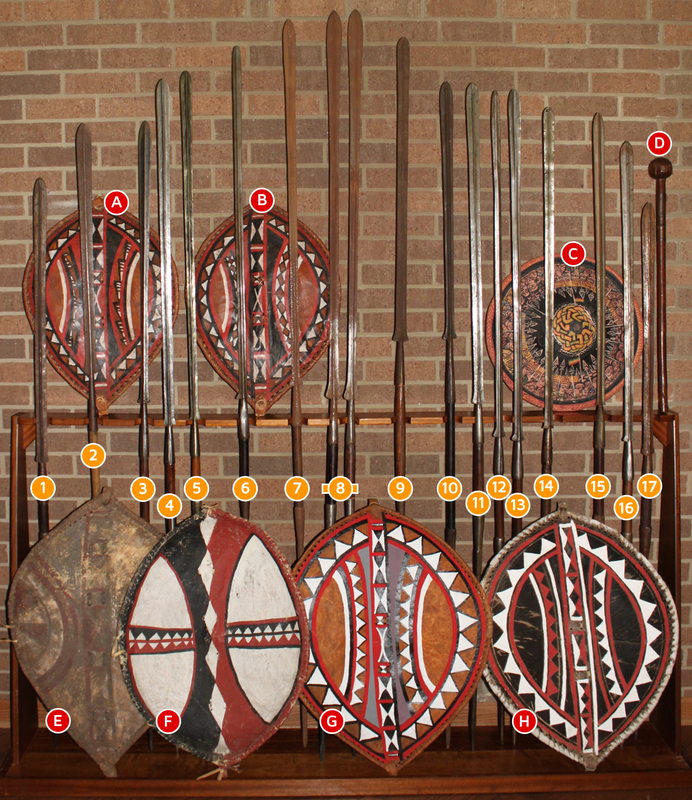 We are partial to Zulu Shields, Maasai lion spears/shields and intricately crafted Kuba spears from the Congo. Many sizes, materials and tribes are represented in our extensive inventory. Most of our items are at least 75-100 years old and some are much older. 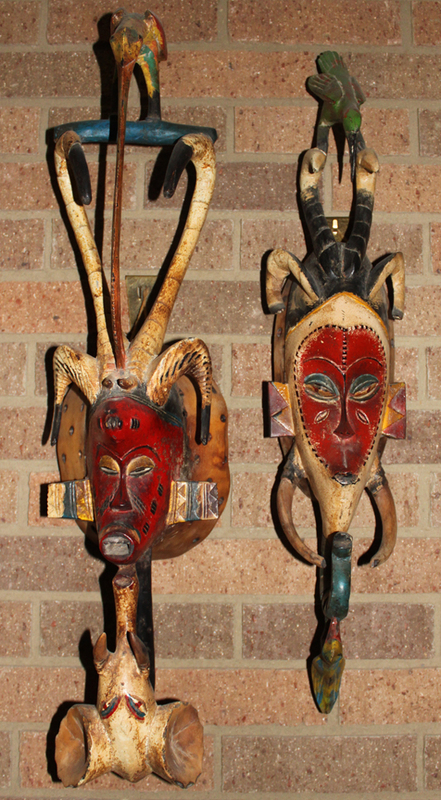 They were acquired from European museums or at auction. Many are coated from the soot of hundreds of wood fires and are readily distinguishable from their mass-produced replicas. The items shown are a small sampling of our collection. Please keep in mind that our online inventory sells quickly, however we set aside a few special pieces that are not offered on our site or in our annual catalog to serve as substitute items. If you are looking for something in particular or want more details on an item, call us at (419) 529-5599. We have one of the largest African weapons collections in the country and are particularly fond of Maasai Lion and Zulu stabbing (Iklwa) spears. Very Old (pre-1900), Old (1900-1930), Antique (up to 1960) and Current items available. These ancient shields are the perfect conversation piece for your trophy room. For every 50 antique spears we get in we only get one shield like this as leather does not last nearly as long as wood and steel. These are getting harder and harder to acquire so if you have been looking for one, now is the time to buy it. The antique shields we offer in our annual catalog are usually sold out in 1-2 days. This shield dates back to the turn of the last century and is in great shape with a vibrant white, red and black color scheme. This large shield is in great condition, measures 38" x 22", and is heavily built-$2,300 - SOLD! This decorative, eleven spear collection came back just after WW II when the Congo was of intense interest to both the US and the USSR, as it had one of the few Uranium mines in the world. At the start of the Cold War, both countries were trying to build up their inventory of nuclear weapons. The gentleman who bought this back worked for a Pan American Company in the Congo. The tallest spear is 64” and the shortest one is 53”. Each one has a 4” metal spike on the bottom and the decorative top metal (shaft and blade) ranges in length from 23”-12” long. Most of the shafts have a spiral decoration on them and three look like they have been replaced. The shaft on the spear in the #5 position has been replaced since the photo was taken with a natural African mahogany shaft of the same diameter and length. The stand is hand forged steel and is riveted together. It is 20” wide at the top, 12” wide at the tapered bottom and the two sets of feet are 11” from front to back. 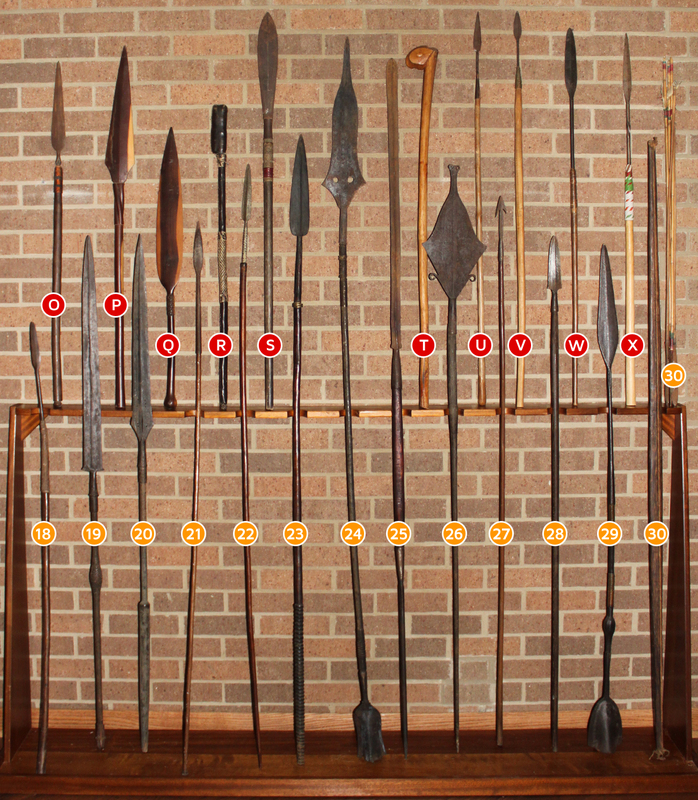 When the metal stand has all the spears in it, it measures 34” from the tip of the shortest spear on one side, to the tip of the shortest spear on the other side. 2 Old 69” Junior (tan shaft) Maasai Lion Spear with excellent workmanship and 33” top section-$649 SOLD! 4 Old 73” Senior Maasai Lion Spear with very long, nicely forged blade and nice bottom metal- $799 SOLD! 5 Old 74”Junior Maasai Lion Spear with very long, nicely forged blade- $749 SOLD! 7 Old, heavy and extra-long 80” Senior Moran Lion Spear with nice, wide blade. Covered with a thin coat of rust but happy to remove it if you like at no extra charge -$849 SOLD! 8 Rare, old matched pair of 82” Jr. Moran Lion Spears (perfect for crossing) with nice top and bottom metal work. Comes with an old pair of Maasai leather sandals-$1,799 SOLD! 11 Very old 73” Senior Moran Lion Spear with everything you look for in a museum quality piece, excellent metal work with a short shaft, flared guard and detailed bottom metal-$899 SOLD!